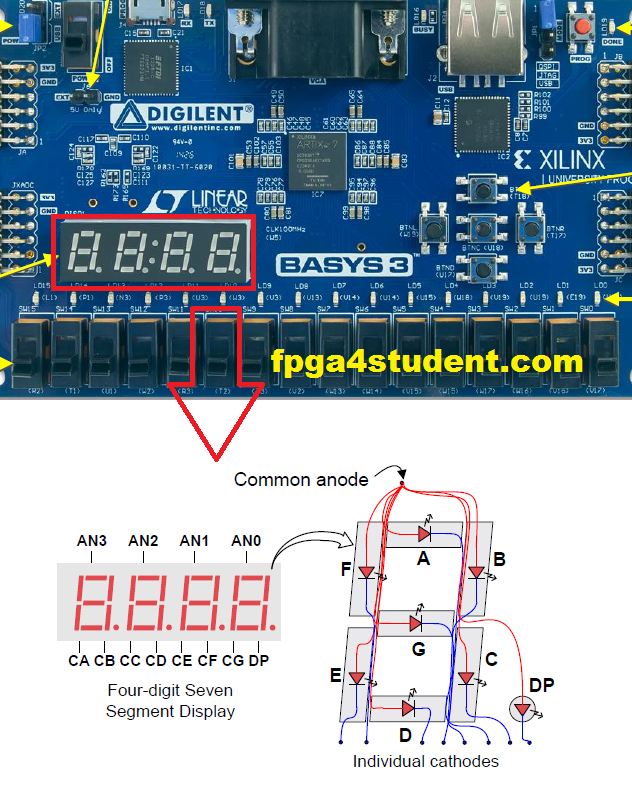 This FPGA tutorial will guide you how to control the 4-digit seven-segment display on Basys 3 FPGA Board. A display controller will be designed in Verilog for displaying numbers on the 4-digit 7-segment LED display of the Basys 3 FPGA. 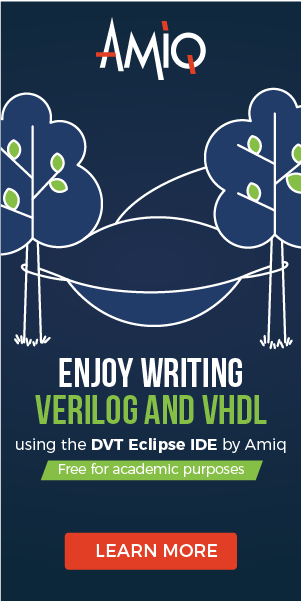 Full Verilog code for the seven-segment LED display controller will also be provided. The Basys 3 FPGA has a common-anode 4-digit 7-segment LED display as shown in the following figure. Seven anodes of the seven segments in a single LED are connected together to one common anode node while its cathodes are separate as shown in the following figure. DP-segment is to illuminate the dot so we omit the DP-segment for now since it is not contributing to the number value of the seven-segment display. To illuminate LED segments such as A-G, anodes of these segments need to be at the 'high' logic level and cathodes should be at the 'low' logic level. 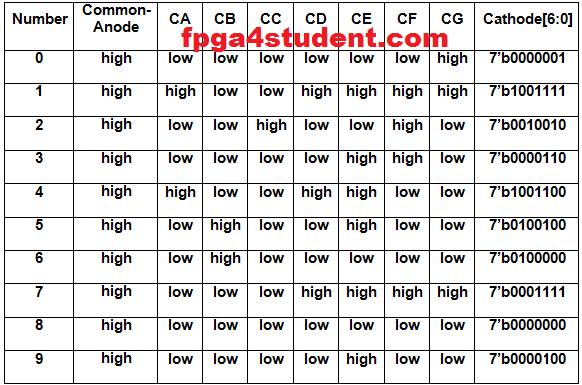 Thus, the common anode node should be high to activate a single seven-segment LED display. The logic levels of cathodes can be varying from low (illuminated) to high(un-illuminated) to show different decimal values on a single 7-segment LED display as follows. The table shows the needed cathode patterns for showing corresponding numbers on a single 7-segment LED display of the Basys 3 FPGA board. For now, we know how to display numbers on a single seven-segment LED display on Basys 3 FPGA board. However, the cathodes of four seven-segment LEDs on Basys 3 are not separate but connected together as shown in the following figure. 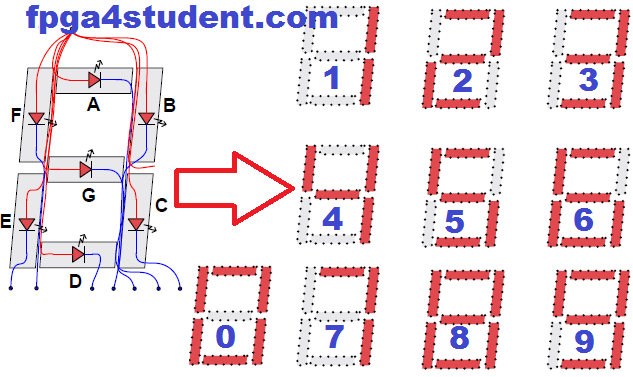 Thus, to display 4 different numbers on the 4-digit seven-segment LED display, we have to control the cathodes (CA-CG) of the four seven-segment LEDs separately by activating the four seven-segment LEDs at different times. For example, when we activate LED 1 by driving A1 high and the other three LEDs (LED 2, LED 3, LED 4) are deactivated (A2, A3, and A4 not driven), the cathode pattern (CA-CG) will be used for displaying numbers on LED 1. Similarly, LED 2 - LED 4 can be displayed by using the same way at different times. As shown in the figure above, we can control activating four seven-segment LEDs by using 4 PNP transistors AN0-AN3. When a transistor is on or the Base terminal (W4, U4, V4, or U2) is low, the corresponding anode is driven high to activate or enable the corresponding seven-segment LED. When a LED is deactivated after illuminating, it will darken. To avoid the displaying discontinuity perceived by the human eye, the four seven-segment LEDs should be continuously refreshed at about 1KHz to 60Hz or it should be refreshed at every 1ms to 16ms. Now, we know how to control and display numbers on the four-digit seven-segment LED display on Basys 3 FPGA. Next, let's design the 7-segment LED display controller. The Basys 3 FPGA has a clock source of 100MHz and we need a 1ms-16ms refresh period or a 1KHz-60Hz refresh rate. 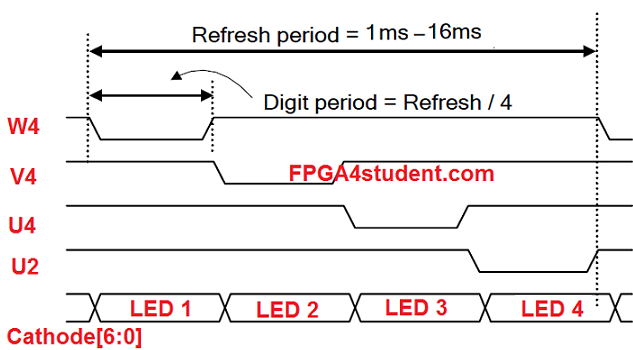 I will choose a refresh period of 10.5ms (digit period = 2.6ms) so that we can use a 20-bit counter for creating the refresh period with the first 2 MSB bits of the counter for creating LED-activating signals (digit period of 2.6ms) as shown in the timing diagram above. After that, we need to generate the anode signals (W4, V4, U4, U2) for the four-digit 7-segment LED display based on the LED-activating counter. The LED-activating counter will repeatedly count from zero to three for continuously activating and updating the four seven-segment LEDs. The design for 7-segment LED display controller is basically completed. Let's use the controller to display a 16-bit counting number on the four-digit seven-segment LED display of the Basys 3 FPGA board with the counting period of 1 second. Now, create a new project in Vivado, choose the device part number of XC7A35T-1CPG236C for Artix-7 FPGA on Basys 3 FPGA board. Then, add the source and constraint files, and generate the bitstream. Program the FPGA using the bit stream and see how it works on the Basys 3 FPGA board. Here is the full VHDL code for seven-segment display on Basys 3 FPGA. 2. 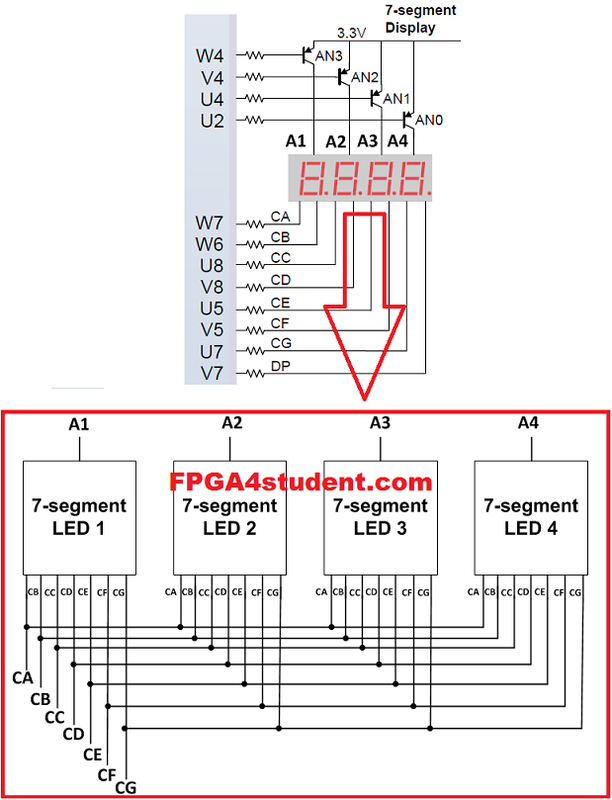 What is FPGA Programming? I didn't understand how 19-bits = 190Hz? 19 bit refresh counter can count up to 2^19 - 1 = 524287. The clock input is 100Mhz. So you can obtain the refresh rate = 100,000,000/524,287 = 190 Hz. Ahaaa, but if I do same to the one second counter the result is not pure 1 sec ! Is that calc Ok? and you cant get pure 1 sec ? but how if I want a precise clock in micro sec or even nano sec? If you use a 27-bit counter, it will count up to 134,217,727. Therefore, you need to reset the counter to 0 when it reaches 100,000,000. Then, you will get 1 second clock. So, you are generating a 190Hz refresh rate by benefiting the overflow of the variable when it counts up to 524287 + 1 ? Make a mod 100 counter using 8 bit counter and when the counter reaches 100 (01100100) clear it to zero by taking the Q(6),Q(5) and Q(2) bit of output to the input of and3 gate and feeding that output to clear of counter ..
please provide tutorial on interfacing of lcd(digilent pmodclp) with basys 3 fpga. For example: You have a 4-digit number: 1234, that code will take out the number "4" for displaying. Hello, Where can i get the full circuit diagram of this? The provided code is to display 16-bit number on the 4-digit 7-segment LED display. Exactly what you need.